Reduce your speed gradually, keep the vehicle straight. Move to the edge of the road safe, away from traffic. Do not stop on the line dividing the highway. Park at the flat and grounded in strong. Turn off the engine and turn on emergency lights. 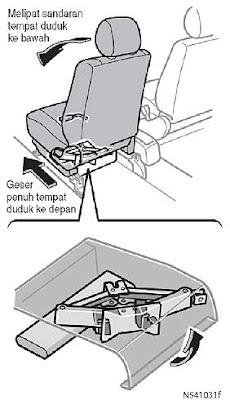 Pull the brake lever completely and move the lever to position "P" (automatic) or reverse gear (manual). Invite all the passengers fell through the safe side. 1. Take the necessary equipment and spare tires. To prepare yourself for emergencies, then you must understand the use of the jack, any equipment and storage locations. When storing the jack, put the jack into place safely to prevent throwing the jack in the event of a collision or sudden braking. Play hookup jack by hand. To disconnect: Turn junction in the direction of the jack 1 to jack free. To store: Turn the jack on the direction of junction 2 to the jack tied securely to prevent it was thrown forward during a collision or sudden braking. 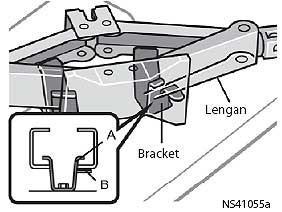 Put the arm on top of part B in the bracket, as shown in the picture above. Adjust the arm so that part A of the bracket is in the arm. 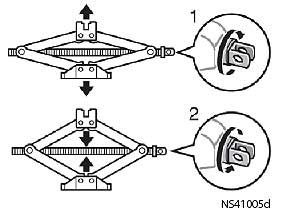 Rotate the junction until the arm is in contact with the bracket. Open the back door, you will find the spare tire clamp bolt near the rear door lock. Loosen the clamp bolt spare tire with lock nut. Lift the tires up a bit and loose clamps terms of its place. Slowly lower to the ground and place the spare tire off. When someone broke the rear tires, loose spare tire in the following ways: 1) loosen the clamp bolt spare tire, 2) move the spare tire to the right, 3) push onto the spare wheel, and 4) pull the spare tire from vehicle. 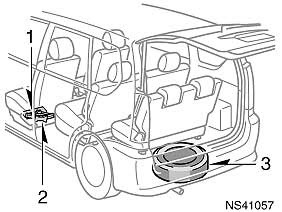 When storing the spare tire, put the spare tire into place with the outer wheel side facing up. 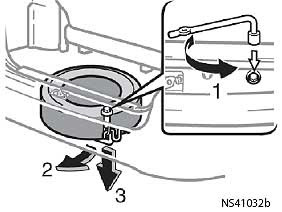 Next, tie the spare tire by repeating the stages of the release mentioned above, in reverse order, to avoid throwing the spare tire in the event of a collision or sudden braking. 2. 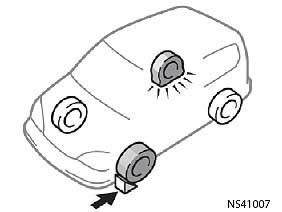 Chock the wheels on the opposite side of the diagonal with a flat tire, to keep the vehicle does not slide when jacked. When the jammed wheel, place a wheel chock from front to front and from the rear wheel to rear wheel. Lift-wheel ornament using the flat edge of the wheel lock nut as shown in the picture.